Also released under the title Dellamorte Dellamore this bizarre Italian made film is about a cemetery caretaker, Francesco (played brilliantly by Rupert Everett) who presides over a cemetery in the small town of Buffalora. 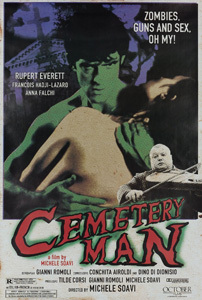 This is no ordinary cemetery though, the dead who are buried here return to life after seven days and Francesco, aided by his monosyllabic sidekick Gnaghi is charged with ensuring they don't escape. This is a witty and gory flick with great direction from Soavi (a protégé of Dario Argento). The plot is pretty disjointed and the film plays like out like a series of short stories about Francesco's experiences and his comical attempts to find love which all seem to end with death. This is satisfyingly dark, extremely original and thoroughly absurd, a great night's entertainment.